Once Dr. Gravlee could see the gross physical changes in the hoof that were achieved from supplementing the horse's diet, he sought the expertise of Dr. Susan Kempson at the Department of Preclinical Veterinary Sciences, University of Edinburgh. Dr. Susan Kempson specializes in electron scan microscopic anlaysis of the hoof structure. These studies showed how the nutrition affected the molecular level of the hoof structure to result in a healthy hoof appearance. proven to be successful for all different types of hoof horn problems." Summary: Farrier's Formula® feed supplement was added to the diet of 18 horses with 2 types of hoof horn defects. The first group of horses showed sand cracks and crumbling horn around the nail holes, the second group suffered frequent bruising and had flat feet with collapsed heels. Hoof clippings from both groups were studied in the transmission and scanning electron microscopes. All of the horses showed a progressive improvement in the gross and microscopic structure of the hoof horn, starting 6 weeks after the supplementation began. Once good quality hooof horn had grown, there was no relapse during the 2 year period of the study. Indeed, one horse was so sensitive he had not been able to wear shoes for 12 months, and was only sound on soft ground. The results were remarkable; "All of the horses showed improvement with increased horn growth." Within 6-12 weeks, all of the horses retained their shoes for a longer period of time. The first positive effects of Farrier's Formula®, according to experience, are visible after 2-4 weeks in the form of a more glossy coat. After 9 weeks into the study, improvements in the horn quality below the coronary band were already visible. This layer of denser horn is easily differentiated from the old hoof horn. Electron microscope examination proved that the horn quality develped incresasingly more stable structure in the course of the study, and defects in the horn were eliminated. In the course of the study all horses showed a clear improvement in their appearance and in the growth of the hoof horn. 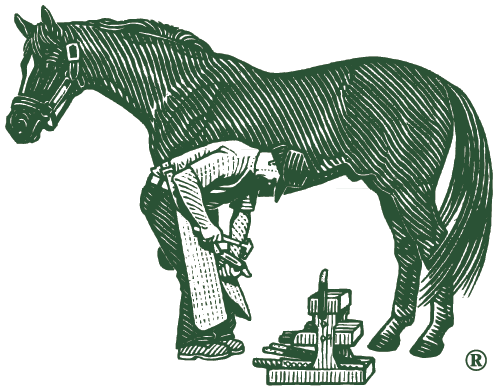 The quickest to react were those animals in the first group with visible horn defects such as sand cracks: Already after six to 12 weeks an extended shoeing interval was apparent and the farrier noted "a considerable improvement in the firmness and stability of the hoof wall". In the case of the horse with the particularly severe hoof defects after eight weeks it was possible to observe a disappearance of the crumbling horn around the nail holes. In its place, a firm elastic horn gradually grew. After 8 weeks of supplementation with FF, a visible ring of newly formed, physiological coronary horn became apparent in the horses with flat hooves, poor hoof growth, or collapsed heels. After 5 months a bulge was formed, which after 2-3 further months was gradually replaced by a newly formed, firmer hoof horn. At the end of the study period in all sample horses a considerably improved macro and micro structure of the new hoof horn could be determined as a reaction to the feeding of Farrier's Formula®. A microscopically visible improvement of the horn growth and the horn quality that was spread over 2/3 of the horn capsule could be determined in all animals after an average of five month's supplementary feeding with Farrier's Formula®. Also, in the horses that were fed a "biotin only" supplement without success, the horn quality was improved substantially when supplemented with Farrier's Formula®.